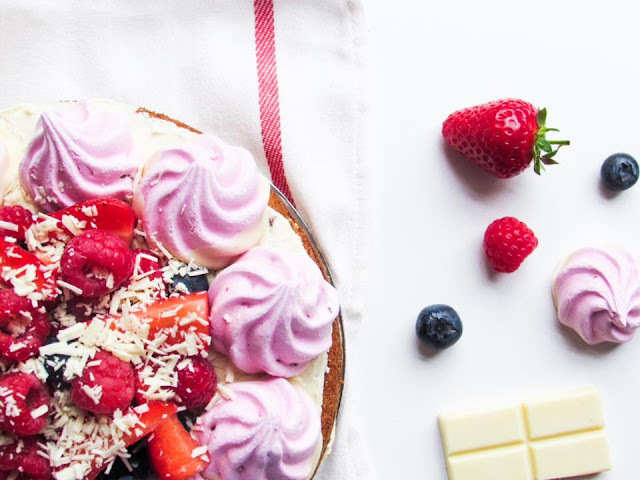 Summer is well and truly here, so what better way to celebrate than with a White Chocolate Eton Mess Cake? I don't know about in your house, but Eton Mess is a summer essential in ours. The combination of fresh berries, cream and sweet meringue makes for the perfect dessert sitting in the garden. 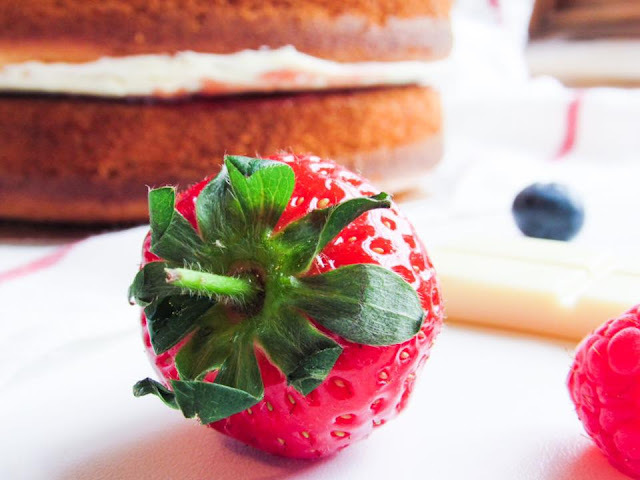 The idea for this cake came from when I started maternity leave - I had taken a strawberry and white chocolate cake into work and didn't manage to have a slice before it was all gone. Leaving cake in a work place is a dangerous business! I decided to have a go at making my own version for when I was next together with friends (as much as I'd like to bake a whole cake and eat it I think that would do nothing for the waistline). 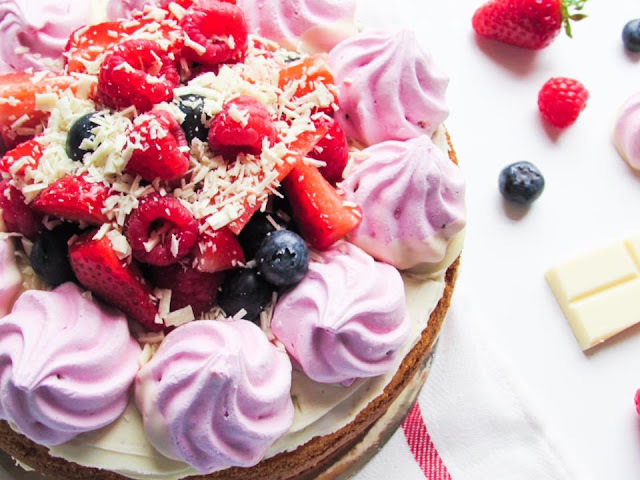 The addition of strawberry meringues and a variety of fresh berries makes for a deliciously luxurious cake and quite the centrepiece without a lot of hassle or time. 1) Preheat your oven to 190'C. Line two 20cm cake tins with greaseproof paper. In a bowl beat together the caster sugar, butter, eggs, baking powder, milk and flour to create a smooth batter. 2) Divide the mixture between the two lined cake tins and bake for around 20 minutes, or until a cocktail stick/knife comes out clean when stuck through the middle of each cake. 3) Transfer the cakes to a wire rack to cool completely. While they are cooling you can make your buttercream by beating together the icing sugar and butter until light and smooth. Stir in the vanilla extract and melted white chocolate. If you're cakes aren't completely cool at this point put the buttercream in the fridge. 4) Once the cakes are cool you can spread the white chocolate buttercream on one of the cakes and strawberry jam on the other cake. Make sure to keep some buttercream back for the top of the cake too. Then flip one of them over and sandwich the two sponges together. 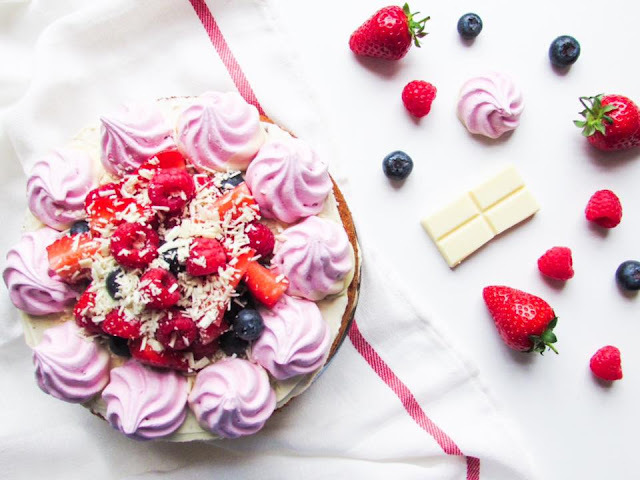 5) To decorate spread the remaining white chocolate buttercream over the top of the cake, place the strawberry meringues around the outside and pile your fresh berries in the middle. I like to dip some of the meringues in a bit of melted white chocolate the night before making this, then leaving them to set on greaseproof paper in an airtight container. This helps to keep them crispy and adds an extra chocolate hit. To make the white chocolate shavings use a vegetable peeler to 'peel' a block of white chocolate. You'll be left with these shavings which you can sprinkle over the cake to finish. 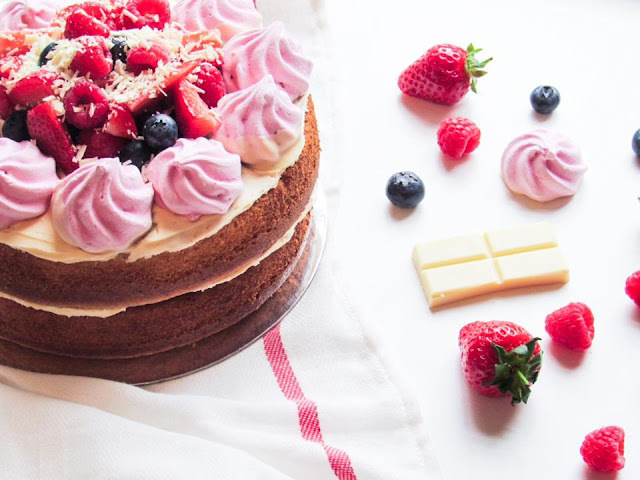 There you have it - luxurious white chocolate, refreshing berries and freshly baked cake...what more could you want on a summer's day? Oh my goodness this looks amazing! Seriously impressed you found the time to make this with a new baby and toddler!!! Ooooh I saw a photo of this earlier and really want to make it. It looks so good! I don't think I'd be able to make it as pretty as you have. I love Eton Mess and this looks even more delicious. What a fantastic looking cake! We love making Eton Mess as its so simple to make but never tried it with sponge! Oh wow!! 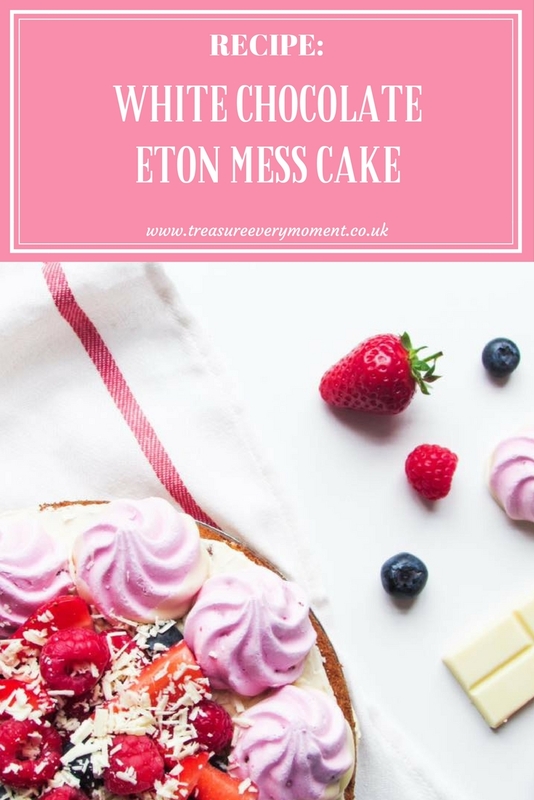 Eton mess cake sounds delicious?!! Eton mess is one my favourite desserts but this just looks amazing!! This literally looks sooo good!! <3 <3 I need to try this!